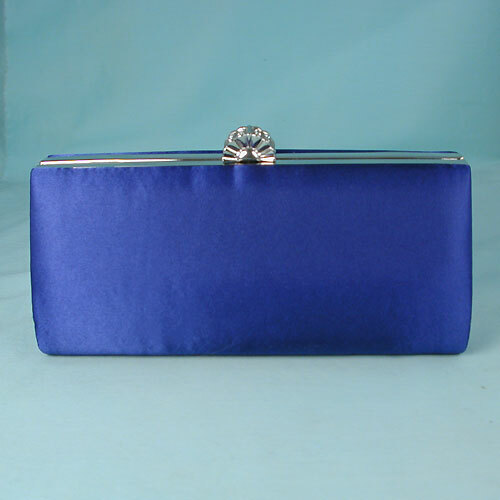 Satin Evening Clutch Evening Bag Purse with Rhinestone Clasp Satin clutch bag with metal frame and rhinestone clasp. This is a small, compact evening bag that hold a cell phone and several personal items. It comes in many fashion colors. The snap crystal rhinestone clasp lifts and pushes away to open. The inside is completely lined and has a side pocket. It can be carried as a clutch purse or over the shoulder with its retractable shoulder chain. This is a classic bag with smart styling. Color: royal Hue: Code: #00009C.